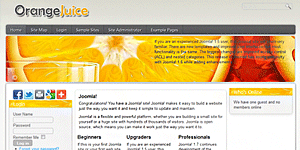 I can’t make the top menu work in joomla 1.7… any help? I’ve done everything you said in “Set Module Positions” and it still doesn’t work. 2) Go to Module Manager, create a new menu item with “menu” position and choose “Test 2” in your dropdownlist in the Basic Options. 3) Go back to Menu Manager, make a new item inside “Test 2” – the name of the item will be the name in your menulink. 4) In order to make submenus (dropdownlist), your items must be set as parent item inside f.ex “Test 2” – and same here; the name of the subitems will be the name in your submenu. Beside, I’ve noticed this dropdownlist works perfectly in Firefox, but in IE it will not (for some reason) show the dropdownlist in the current menu you are watching. You are in main page, you can see the submenu in Menu 2, you click on menu 2, but then you can only see the submenu in the other menus, except Menu 2.
i tried to do top menu but fail.. Please help me the steps..
Ok. I managed to solve the problem.